A tweet from Hannah-Elizabeth, who blogs at The Last Classic http://sonnemann.wordpress.com inspired this post. She follows my book reviews and recently asked for a recommendation on something to read. The other inspiration was the Olympics opening ceremony, which got me thinking of English novels and stories. My greatest literary pleasures, from the first read-alouds I heard as a child until now have come from England. The riverbank, the Shire, and Baker Street have become the landscapes of my soul. There’s one key distinction to make: when I talk about favorite novels, I don’t mean breakout, thrilling, or dramatic novels – necessarily. I mean stories with characters and worlds I want to live with and visit again and again. When I started The DaVinci Code, for instance, I couldn’t put it down, but when I finished, I traded it in for credit at the local used bookstore. I can’t imagine reading it again. So here is a list, probably not complete and not in order of preference, of some of the story treasures British authors have given me. To set the mood, let’s begin with this beautiful hymn that every diehard fan of Masterpiece Theater knows and loves. “Jerusalem” was inspired by William Blake’s poem, “And did those feet in ancient time,” which was based on the legend that as a youth, Jesus visited England and Glastonbury with his uncle, Joseph of Arimethia. The Wind in the Willows by Kenneth Grahame. I reviewed it here: http://wp.me/pYql4-19a. 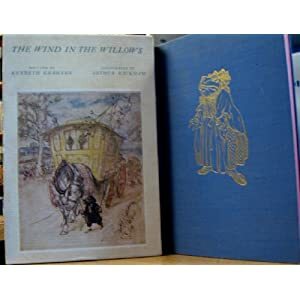 Try to get the edition illustrated by Arthur Rackham, which really gives a feel for the rural England of rivers, forests, and fields that were so soon to disappear in the new century . The Lord of the Rings by J.R.R. Tolkien – Here was a man who spent his life giving shape to our spiritual homeland – The Shire and Rivendell. His son said he suffered from bouts of depression all his life. Understandable when you reflect that the summer this gentle dreamer graduated from Oxford, he was thrown into the maelstrom of the Somme. There he saw the Shire, the rural England he loved, along with his college classmates, evaporate in the fires of Mordor, aka, the western front. The Original Illustrated Sherlock Holmes by Sir Arthur Conan Doyle. I read these detective stories again and again, even though I know who done it. Who doesn’t sometimes dream of life on Baker Street, sharing a pipe with Holmes before the game is afoot again? I could argue that Holmes was an early superhero, using uncanny intellect and powers of observation to save the world from uber-villain, Moriarity. The Abhorsen Trilogy by Garth Nix. Nix, a former editor, has written a number of middle grade Arthurian adventures for boys. In the Abhorsen tales, he gives us two fine female protagonists. In doing so, he inspired my first novel, whose main character, Emily, is a lot like Lirael, the heroine of the second and third books of the trilogy. Nix lives in Australia, but the map of his Old and New Kingdoms looks a lot like the Scottish border, and everyone acts quite British, sometimes to the vexation of the good guys. T.S. Eliot: The Complete Poems and Plays, 1909 – 1950 I’ve been reading this book since I took a class on Eliot as a college sophomore. “The first gate” into the world of imagination and dream is an image at the opening of Eliot’s “The Four Quartets,” my favorite poem of all time. Eliot was an American who spent his writing life in London. The Narnia Tales by C.S. Lewis. Tolkien told Lewis not to publish the Narnia stories, saying Lewis would “embarrass himself.” Just goes to show the master of middle-earth didn’t know everything. Mysterious old wardrobes will always be objects of interest to fans of Lewis’ series. Mythago Wood by Robert Holdstock. A small patch of primeval forest, one of the last in England that dates from the last ice age, is actually a “mythogenic zone,” a region which manifests the creatures of the deep human psyche and racial memory. They deteriorate at any great distance from the wood, but near and in it they are very real – sometimes dangerously so. in 1946, when Stephen Huxley returns from the service, both he and his older brother Christian, strive to enter the wood with the aid of a mysterious journal (don’t you just love those!) left by their father. Both Stephen and Christian fall in love with Gweneth, who lives deep in the forest. When his brother begins to assume the attributes of the dreaded “Outsider,” you know Stephen’s journey will not be easy. Published in the US in 1986, this book had a profound effect on my outlook on fantasy literature. The Mabinogian Anonymous. Welsh tales, full of strange and sometimes ominous magic, that were already ancient when they were written down in the middle ages. Joseph Campbell and Heinrich Zimmer discussed some of these stories. They are best approached with poetic imagination as Fleetwood Mac did with the goddess, Rhiannon, who figures in two of the tales. I hope this excursion through some of my favorite books leads you to something enjoyable to read. Lists are fun. This was a small list, so next time I’ll post some with hundreds of titles to choose from. Stay tuned! This entry was posted in Authors, Book Reviews, Books, Fantasy and tagged authors, books, English storytelling, fantasy, fiction, Novels. Bookmark the permalink. Well, as usual, there are a lot of books on this list I’ve never read. I think I might start with the Peabody mysteries and Mythago Wood. They sound terrific. Thanks, Morgan. The Peabody series is great. I can’t remember exactly where I started – it was near but not right at the beginning. I read the first book later on and it wasn’t one of my favorites. I’m guessing the website will offer a synopsis. FWIW I worked in Swindon and visited Avebury many times around the same year as your photograph. I don’t recall seeing you. 🙂 I was (amateur) training for marathons as a side project and ran the 11 miles from Wanborough to Avebury several times, then I would hitchhike back.